Shardminds are crystalline creatures consisting of hundreds of small shards of translucent green, white, red, or amber crystal assembled into humanoid form and animated by a force of pure psionic energy. Shardminds choose their forms to mimic the shapes of humanoids; some take on forms that seem more masculine, while others appear more feminine. A Shardmind's animating force glows dimly from within each of its component shards, emanating most brightly from where the eyes of a natural humanoid would be. This inner light sheds dim light in a Shardmind's space, but a Shardmind individual can squelch the light with an instant's concentration, useful for hiding in the dark for example. The crystalline fragments making up a Shardmind's body are in constant, silent motion, almost like the circulation of blood. When a Shardmind is stunned or unconscious, it might lose control of the tight mental reins that keep its body in humanoid form, a few shards slipping free into orbits around its body until the Shardmind regains control. Shardminds are living creatures only in the loosest sense. Their crystalline bodies require no sustenance, and they don't breathe. They don't need sleep, though they must still rest for six hours to gain the benefits of an extended rest. They don't have gender and don't reproduce, but the Shardminds alive today aren't the same ones that sprang to life during the Dawn War. 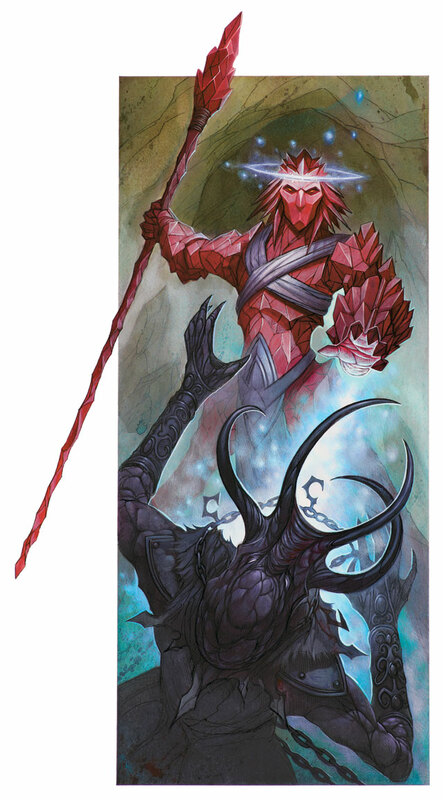 Shardminds say that the Living Gate shattered into countless fragments, and each individual Shardmind makes a new Shardmind from the living crystal gardens they have tended for so long. Shardminds are sentient fragments of the Living Gate, which once stood at the pinnacle of the intricate lattice of the Astral Sea. Beyond the gate lay the alien Far Realm, and the gate's destruction during the Dawn War resulted in the rise of the mind flayer empire. Though Ioun's power holds the portal closed, Shardminds seek to rebuild the gate and forever cut off the Far Realm's ability to influence the world. Shardminds are fragments of pure thought given life and substance. They are logical, emotionally distant, and naive to the ways of society in the world. Some approach life with Innocent curiosity, eager to embrace the wealth of experience the world has to offer. Others remain resentful and aloof, bearing a higher purpose in mind at all times. Though they often seem dispassionate, when a strong emotion seizes them, they experience it powerfully. For example, Shardminds don't get annoyed, they become enraged. Although the race as a whole shares a common goal of rebuilding the Living Gate, several philosophies disagree on how to accomplish that goal. The three most important sects are the Thought Builders, The God Shards, and the Shard Slayers. Shardminds are sentient fragments of the Living Gate, which once stood at the pinnacle of the intricate lattice of the Astral Sea. Ability Score Increase. Your Intelligence increases by 2, and your Wisdom score increases by 1. Age. Shardminds were created fully mature, and do not physically age. Alignment. The Shardmind race has spent thousands of years tending gardens of living crystal. Due to this, they are familiar with order and routine and have a strong lawful bent. They are scarcely evil and are usually good or neutral. Size. The average height of a shardmind is 5' 9"–6'2". Your size is Medium. Crystalline Mind. You can communicate mentally with another creature that knows at least one language within a 60-foot radius. This creature doesn't need to share a language with you but unless they have telepathy themselves they can only receive and respond but can't initiate or terminate a telepathic conversation. You must be conscious to use this trait and cannot telepathically communicate with multiple creatures at once. In addition, your thoughts can't be read by any means, and you have resistance to psychic damage. Crystalline Body. Even though you were constructed, you are a living creature. You are immune to diseases. You do not need to eat or breathe, but you can ingest food and drink if you wish. Arcane Ancestry. Because you came from The Living Gate, arcane energy courses through your body. You have advantage on saving throws against being charmed, and magic can't put you to sleep. Psionics. You know the mage hand cantrip. When you cast this version of mage hand, the hand is invisible. You can cast the identify spell once with this trait and regain the ability to do so when you finish a long rest. When you reach 3rd level, you can cast the detect magic spell once with this trait and regain the ability to do so when you finish a long rest. When you reach 5th level, you can cast the detect thoughts spell once with this trait and regain the ability to do so when you finish a long rest. Intelligence is your spellcasting ability for these spells. Languages. You can speak, read, and write Common and one other language of your choice. Additionally, you understand Shardspeak, a strange language made up of deep, resonating humming only communicated by telepaths, and very few beings other than the Shardminds themselves know it. It uses the Primordial script. 5' 5" +1d8 105 lbs. x (1d4) lbs.